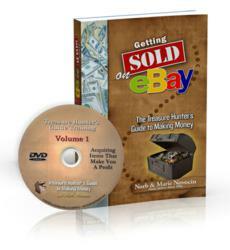 Authors and eBay Power Sellers, Norb and Marie Novocin, finally release their long-awaited tales of success and adventure, Getting Sold on eBay, The Treasure Hunter's Guide to Making Money. With the rising popularity of AMERICAN PICKERS, Storage Wars, PAWN Stars, and ANTIQUES ROADSHOW, the timing seems right for a treasure hunter's guide to making money on eBay. With the advent of social networks such as Pinterest and the ever-increasing popularity of YouTube do-it-yourself video content, the Novocin family is experiencing impressive results. "We began stocking our book in January and promoting it a month later. With the help of a Social Media Marketing Consultant, we engaged in video production and focused on building our Twitter account. I recall several times sending out tweets which promote the book, and within 5 minutes, received notice from Amazon that an order was placed. To our delight, the more we promote our book through video content on YouTube, then support the content with such networks as Facebook and Twitter, the more results we see on our eBay site. Now Pinterest has brought an entirely new dynamic to promoting our auctions on eBay, and we're engaging even more with fellow "Pinners," building excitement around the Getting Sold on eBay brand," says Norb Novocin, owner of Estate Auctions, Inc.
Norb and Marie Novocin continue to think outside of the box in efforts to promote their new book. Their 14-year eBay legacy includes listing some very rare, eclectic, and unusual items such as "The Keys to the End of the World" and "U.S. Government Spy Plane Parts" — which landed armed agents at their doorstep! So having a chainsaw juggler promote a book about selling on eBay doesn't seem so odd to the Novocins. "Our marketing consultant recommended a great site, Fiverr.com, where we found unique ideas and people to promote our book. We've used several of the "gigs," as Fiverr calls them. Our favorite so far is, in fact, Mr. Marcus the Chainsaw Juggler — amazing, different, and passionate — a perfect fit for our book," says Marie Novocin, co-author of Getting Sold on eBay. As of March 2012, the Novocin's eBay seller ID EstateAuctionsInc has maintained a stunning 100% positive feedback rating with well over 15,000 recommendations. They manage to list nearly 100 quality items per week and have seen a spike in traffic to their auctions since introducing their book. "It's a double benefit. We promote our success, the foundation of the book, and demonstrate that making a good living by selling on eBay is full of fun and adventure and pays well, too. Our book is a model and strategy for eBay success that others can duplicate. Inevitably, people on our eBay site end up as happy clients; it happens every week," says Norb. The book is available on eBay, GettingSoldOnEbay.com, and Amazon. The Novocins have also produced the one-hour training DVD, "Acquiring Items That Make You a Profit," which for a limited time is a free bonus with any book purchased through their eBay store or on their Getting Sold on eBay website.